Hotel Silver Star can arrange sightseeing trips to all prominent landmarks in and around Mysore at additional cost. 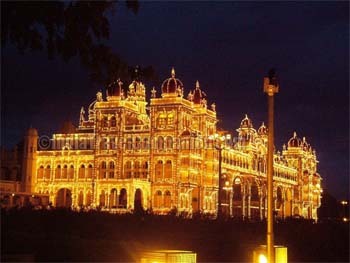 The Maharaja's Palace is one of the important sights in Mysore. Built in Indo-Saracenic style with domes, turrets, arches and colonnades, the Palace is a treasure house of exquisite carvings and works of art from all over the world. Intricately carved doors open on to luxuriously furnished rooms. The majestic Durbar Hall has an ornate ceiling and many sculpted pillars. The magnificent jewel studded golden throne of the Wodeyars is displayed here during the Dasara festival. The 335 meters high landmark, Chamundi Hill can be reached via a 13 km road or by climbing up the 1,000 steps laid out by the Mysore Maharaja's in the 17th century. Half-way up along the stone steps is Nandi, Lord Shiva's Bull, a majestic 4.8 meter monolith. At the top is the 12th century temple of Chamundeshwari, the patron goddess of the Wodeyars. Close to the temple is the gigantic statue of the demon Mahishasura. The summit offers a panoramic view of Mysore's lakes, parks and palaces. Beautiful Cathedral, reminiscent of medieval architectural style, is one of the largest churches in the country. Built between 1933 and 1941 in the gothic style, the Church is an imposing structure with stained glass windows and lofty towers this is a miniature replica of the Cologne Cathedral, the hall is huge with stained glass windows and soaring Gothic Revival arches. The biblical scenes adorn the stained glass windows. The main feature of this church is the reclining statue of St Philomena. The statue is taken out in a procession in the city streets during the festival. Chamarajendra Zoological Gardens was set up under royal patronage in the nineteenth century. Its fauna includes rare and exotic species which are housed in lush, green surroundings. The Zoo is famous for breeding some very rare animals in captivity. Mysore is famous for Handicrafts, Pure Silk Sarees and Incense. Showroom in our premises MYSORE SAREES EMPORIUM and KARNATAKA COTTAGE EMPORIUM offers wide variety of Pure Silk Sarees and Handicraft items. We are one of the best Travel guide for Mysore with interesting stuff about hotels, and weather to make your vacation unforgettable and unbelievable. Customers can come to visit our place round the year. Climate of summers (22-38° C) and winters (10-32°C) is suitable for the visitors.